Shamanism is a term used for a belief system/practice incorporating the empowering and enlightening quality of a descent to the land of the dead. This voyage is a prevalent aspect of aboriginal religion in Siberia and north-central Asia, and among the Inuit and other Arctic peoples of America and Europe. This journey is the essential "shamanic" experience, and it may happen due to an unusually dire and mysterious illness, or by accident, proceeding to a near-death-experience or NDE. It can also be induced deliberately and at great risk. More often, it is accomplished under the guidance of someone who has themselves, had personal instruction in an effective simulation. In this way, a lineage can develop. During the procedure, the imagination is finely tuned through the use of setting, costume, visualization, drumming, singing, gestures, and the manipulation of "props." In Himalayan Buddhism, this experience is more than a ritual. Ani Choying Drolma [pron. cho-yin do'ma ] hear Cho drum & song. <YouTube sign-in may be req'd. The Chod [pron. cho] is a distinctive Mahayana Buddhist practice that comprises a visualization of serving up one's body as an offering to all beings. The notion of self-sacrifice is certainly not unique to Buddhism; it is also the metaphor for Christian sacrifice. And tenderly surround yourself with them. Nourish them always with warm flesh and blood. Befriend them and never dismiss them. It is important to understand though, that Machig is more than a yogi since she is a bodhisattva who works to liberate beings from the suffering inherent in cyclic existence. And though her method is shamanic, she is not just a shaman but a great teacher in the Prajnaparamita ("Form is Emptiness") tradition. Here we see seated above Labdron-ma, the Buddha from whom she emanates flanked by two lineage masters. The one to our right is the Karmapa. Michele Martin translating (2004) Kunzang Dechen Linpa's explanation of Cheu. Refuge field of Shije [pacifying] Chod lineage. More about the theory and practice. How does Chod work ? Another human female venerated as a dakini is Ayu Khadro [kha'dro is the way Tibetans usually pronounce the word for dakini] She, too, is associated with the Chod practice. Born in 1839, she live to be 115 years old. Some might say that her longevity was associated with her devotion to White Tara, too. In her life she experienced what is often called a shamanic illness -- a sickness unto death, after which a person's nature and path is radically empowered with an ability to heal others. The generosity of her husband enabled her to end her marriage and pursue her spiritual goals as a nun. Her life was full of interesting experiences and powerful encounters with dakinis and deities, not only so-called Buddhist ones. In her case, it was almost chance that led to her initiation into the cheu when it did. When a teacher died, she had the news in a dream of a sphere enclosing the form of the person, and borne by dakinis, who are themselves inside a sphere. Read her entire life story here, as told by Namkai Norbu Rinpoche via Tsultrim Allione in the celebrated book, Women of Wisdom. The term shaman is a word that has been used by speakers of European languages only since the 1780s. It was adopted from Turkic and Altaic (Turkoman and Siberian) but was not well understood. As the spiritual views of less familiar cultures became better understood, it has come to be applied to any "medicine man" or "witch doctor" -- someone feared for his or her perceived ability to commune with spirits. In a categorical way, it is currently in use for almost anyone whose exceptional qualities, innate and/or learned, are used to benefit others within the context of a world view that includes several realms of existence, not only that of the visible or material reality. Asia Society article [cached by Google] on Mongolia entitled The Shaman. Korea is known for its shamanic tradition, in which healers known as mudang perform the ritual called gut or kut. There is evidence to show that the idea of a visit to the land of the dead was once more widely known. In the Sumerian hymn, "From the Great Above to the Great Below" the Goddess Inanna-Ishtar lays aside all her attributes and ornaments to descend to the realm of the dead to accomplish a resurrection. A descent to the Land of the Shades or the Underworld, played an important role in the [Greek] Orphic Mysteries. Also, until well into the second millennium many Norse still worshipped Odin (or, Woden, also Wotan.) He was the god who experienced death and then returned as the 'Wise Old Man' with the gift of the runes, the symbols used for writing. Edou, Jerome. Machig Labdron and the Foundations of Chod. Ithaca, NY: Snow Lion Publications, 1995. Eliade, Mircea. Shamanism: Archaic Techniques of Ecstasy. Princeton UP, 1964. Kehoe, Alice Beck. (Shamans and Religion: An Anthropological Exploration in Critical Thinking. University of Wisconsin, 2000.) Kehoe found that Mircea Eliade, who was mainly responsible for introducing the broad usage of the term, and whom she numbers among "armchair" scholars, based his views on very limited experience with the subjects of which he was, for a long time, considered the Western expert. She presents a strong argument that the term "shaman" ought not be used except for Siberian practitioners. Harding, Sarah. Machik's Complete Explanation Clarifying the Meaning of Chod. Ithaca, NY: Snow Lion Publications, 2003. Savvas, Carol D. A Study of the Profound Path of gCod: The Mahayana Buddhist Meditation Tradition of Tibet's Great Woman Saint, Machig Labdron. PhD thesis: U. of Wisconsin at Madison, 1990. Weber, Max. The Religion of India. New York: Free Press, 1958. 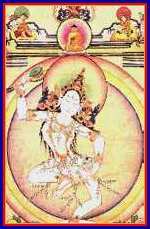 Images in the dakini articles are mainly from the 1994 Tibetan Art Calendar by Wisdom Publications. A new one is available every year for around $30 [US].